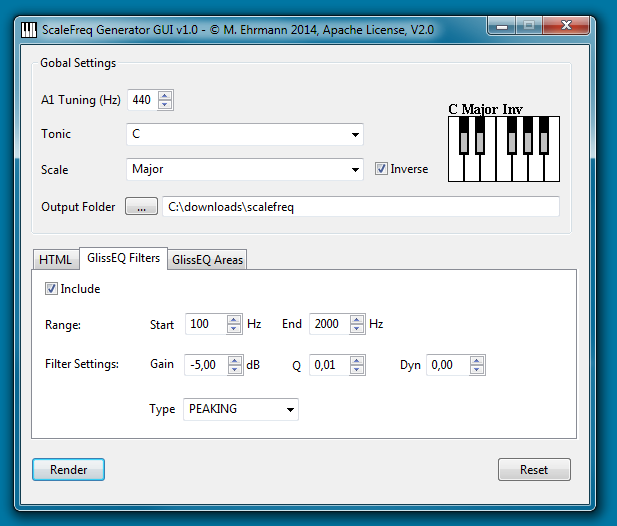 Scalefreq Generator is a tool for rendering frequencies of notes / musical scales into various output formats. It’s primarily aimed for mixing/mastering engineers and other musical interested people. The frequencies of musical scale or non-scale notes (inverse) are important in mixing and mastering situations. E.g. 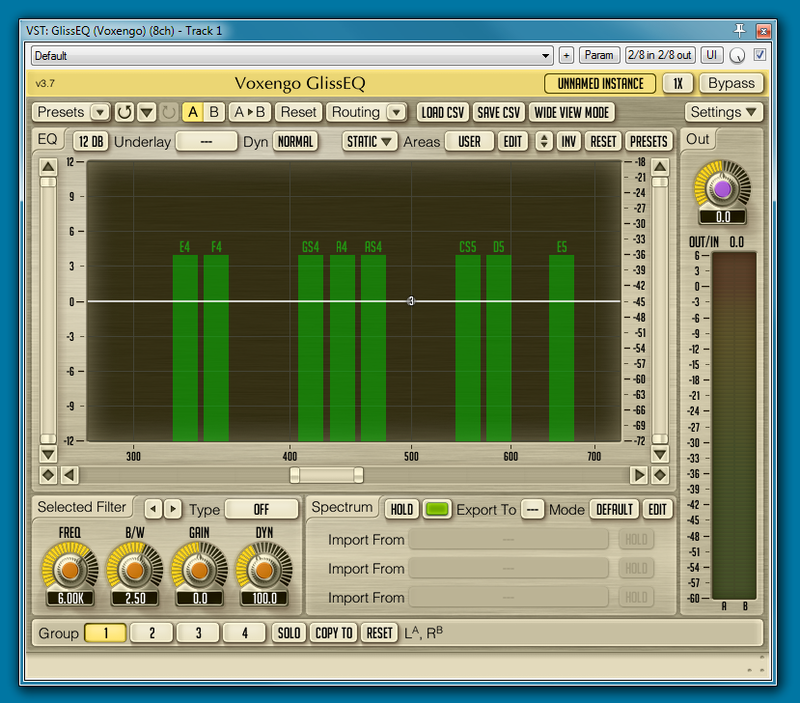 non-scale frequencies are often attenuated using an EQ. Scalefreq consists of a core system, a render-plugin architecture and a graphical frontend for convenient user interaction. The HTML Renderer creates frequency tables in HTML format for any specific scale. Alternatively it can render all tonic variations of a scale (chromatically). 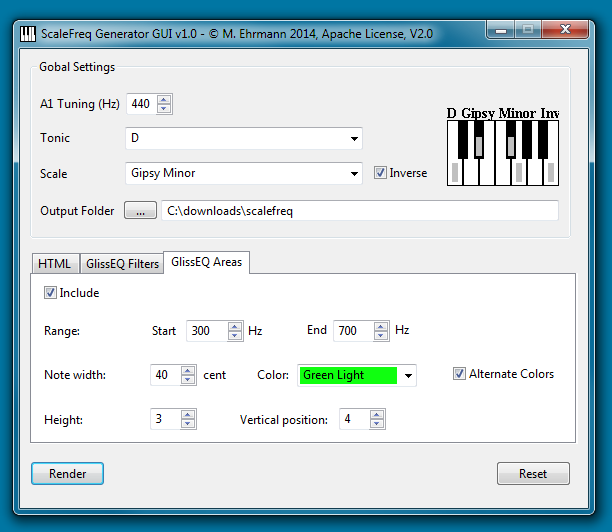 Also a huge HTML file can be generated, which contains all available Scalefreq scales. 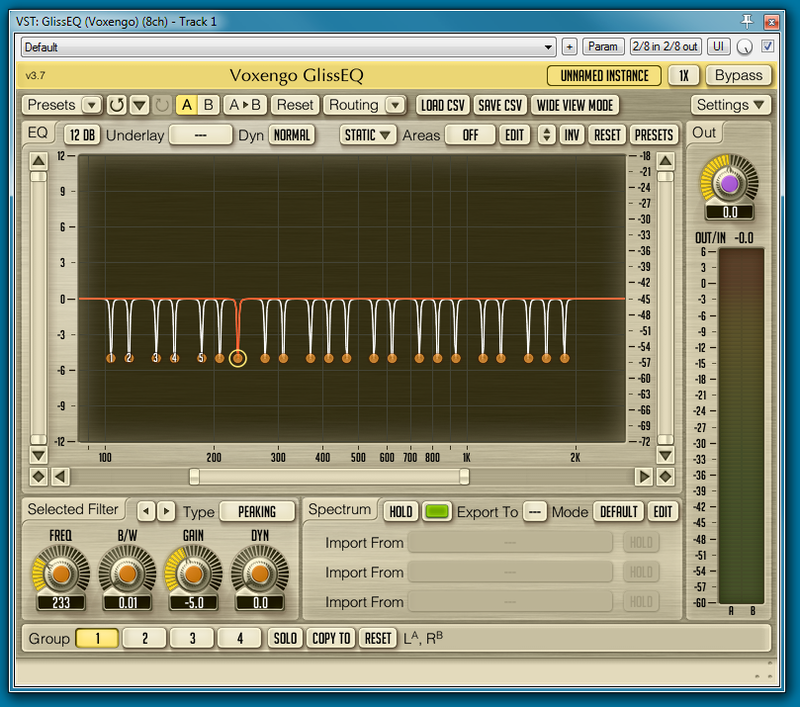 The Gliss EQ filter renderer generates CSV files which can be imported into Voxengo Gliss EQ VST plugin. Thus, it’s e.g. possible to conveniently import notch/peaking filters for non-scale notes (= inverse scale). 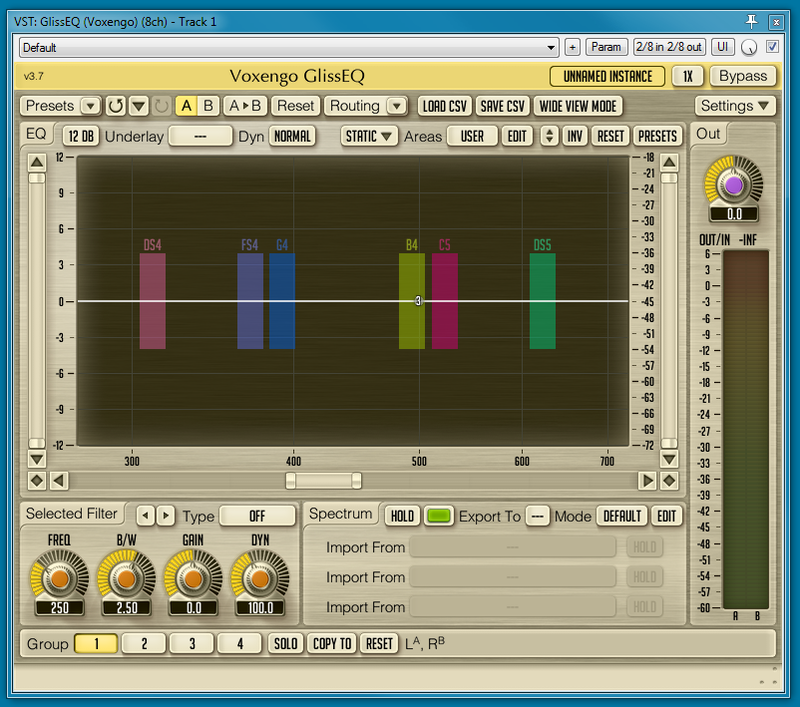 The Gliss EQ area renderer also generates CSV files which can be imported into Voxengo Gliss EQ VST plugin in order to create colorful EQ areas marker. A Java 1.7 Runtime Environment (JRE or JDK) is required. HINT: scalefreq stores all made settings in the current user profile. In order to reset the settings press the reset button. If you want to develop another plugin/renderer for Scalefreq (really easy !) just contact me. I’ve planed to release the source code if enough people are interested. Also if you’re interested in different scales etc. just let me know ! Please do this for the great Meldaproduction MAutoDynamicEq and MDynamicEq plugins. I had a look at it. Seems that the area presets are stored in a proprietary format. Though, if Melda Productions would provide the format specs I could do it. I have GlissEQ and this is going to be great for removing unwanted frequencies from atmospheric samples using inverse scale! seems, it search only for win-swt libs. Thanks for the hint. I will look into this. problem is fixed ! Now it should run on Win,Linux GTK, MacOS. Either 32 or 64 bit shouldn’t matter. Other platforms are theoretically possible, but not supported out of the box. Thanks for feedback, which Java Version do you use ? well, i just realised, that i didn`t actualy install the full java on my mac. But now i got version update 25 installed and still get the same error. What’s the major java version, is it 1.7 ? Hi, great software, did you release the source code until now? I’d be happy to have a look and maybe contribute somewhere..
Hey thanks, so far I didn’t release it. What do you have in mind ? Having some trouble getting scalefreq running. When double clicked, I choose to open with java, I have downloaded the latest JRE and running windows 7 pro. I may need some help from someone who knows what they are doing LOL. 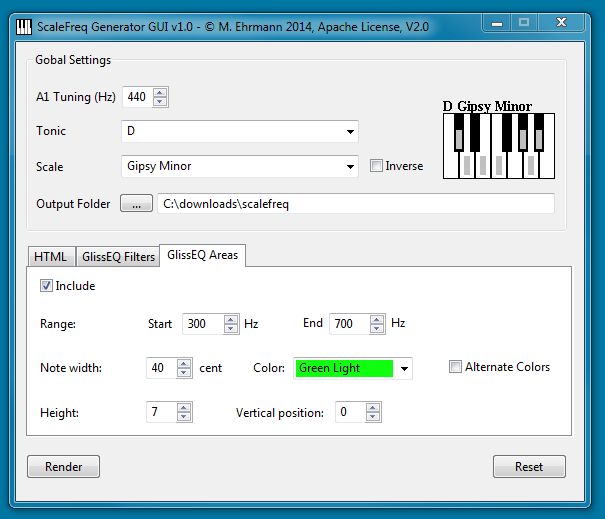 Might I suggest though that a renderer be created for DMG Equilibrium presets, or would that be redundant because it already has a piano roll? I figured it would still be more efficient the doing it all manually. I’m very interested to hear you expand upon your theories on the attenuation of non scale frequencies, how it relates to music theory, arrangement/automations and if you find any other side effects of the process of inverse eq. Do you find it helps with creating more headroom, perceived loudness, front to back depth? Lastly, I enjoyed your sound design for your latest DnB track, the transients align very nicely with the body of the sounds. Does extreme eq such as a series of notches help you with layering your different bass patches like kick and sub or snare and midrange bass, how so? java -jar scalefreq_1_01.jar. E.g. on windows: press windows key+r, “cmd” -> java -jar path to scalefreq_1_01.jar. Java 7 SE >51 should work. @Music theory: what I’ve learned during the years more than everything else: trust your ears and compare your stuff with other releases. It can be helpful of course to boost e.g. a bass note or kickdrum at the frequency of the current scale’s fundamental. Or to lower a non-scale dominant frequency in bass / kick range. Actually, that’s a kind of tuning and as such it should work in some way. On the other hand: almost all sounds are a pretty complex mixture of many frequencies over time. Also bass sounds. So even a non-scale frequency can be quite important. E.g. in deep bass music there’s nothing more boring than a naked pure clean sinus subbass. Therefore many deep bass sounds use some sort of slight distortion and modulation. In sum: trust your ears, first. Don’t rely too much on theories. At least that’s my 2 cents. @DnB: thanks ^^ for feedback. I try to avoid extreme EQing. If there are obvious resonances I’d lower them. Key is as usual: lowcutting of non-bass instruments. Parallel drum compression, Limiting (distortion) of kick & snare and so on.